A short tutorial on creating an image gallery within your WordPress posts to easily share images and albums. Galleries are an appropriate option for posts displaying many visuals like photographs or graphics. Whether you’re a travel blogger sharing your recent journey, or a designer creating a portfolio, galleries are a refined way to exhibit your stories and work. WordPress has many great options. 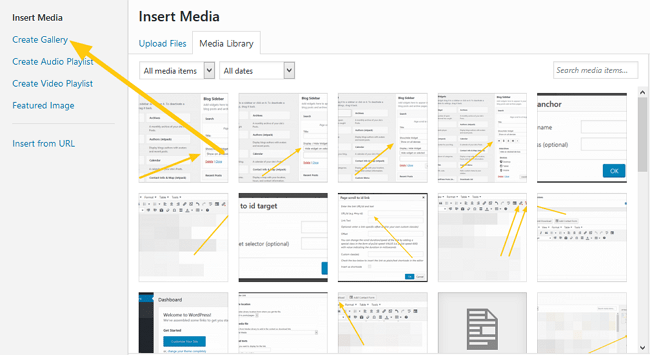 WordPress has a built-in option for creating galleries through your media files. Also, there are some plugins which can help you do it even better by changing designs and styles and other options. You can use whichever way suits you by following the instructions below. It’s easy to directly create a gallery of images in WordPress posts. 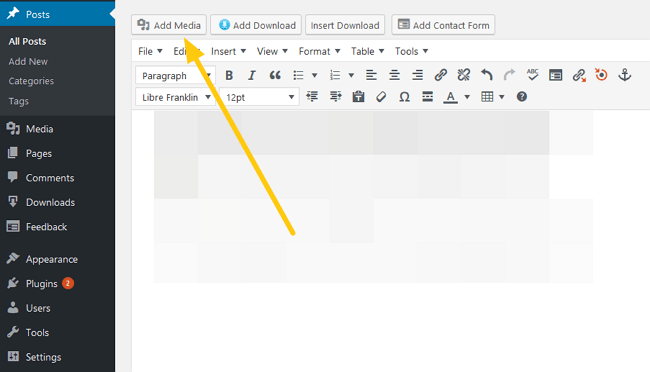 Click on the Add Media button in the WordPress editor > choose the Create Gallery option. 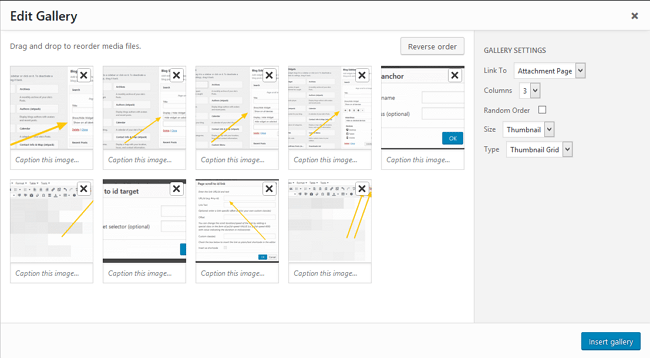 After selecting Create Gallery, you can either upload new images you want in your posts, or simply select from the existing images to create a new gallery. Choose the images you want in your new gallery > change the Gallery Settings and > click on the Insert Gallery button to add the gallery in your post. You can now preview your post to see how the new gallery looks and publish your post. You’re provided with certain options to help you create a gallery the way you want. Here’s what each of those options mean. It has two options. Namely, Attachment Page which opens each image as a separate page, Media File which opens the actual image, and None which triggers no action on click. You can use this option to decide the number of image columns you want in your gallery. Selecting this would display the images in your gallery randomly, without any particular order. It helps you the display size of images in your posts. It gives four options, which are Thumbnail, Medium, Large and Full Size. This option decides the structure of your gallery. It gives you two options, Thumbnail Grid and Slideshow. Both of these show the image as a grid of thumbnail images or either as a slideshow, respectively. While there’s no specific option given, you can change the order of images in your gallery by dragging them. Or you can also click on the Reverse Order button to reverse the order of all gallery images. WordPress gallery option is a lightweight, and probably the simplest way to add a galleries to posts. However, if you need more customization options and additional features, then you can rely on plugins to do so. Here are are few plugins you can use to create galleries in your WordPress posts. FooGallery gives you heaps of other options than the basics. It also comes with retina thumbnail support, built-in templates, shortcode insertion, etc. You can access all the plugin related options and settings by clicking on the FooGallery option in your dashboard. To add a new gallery, click on FooGallery > select Add Gallery > Add Media, and fill in all the details and gallery options as per your preferences > Publish gallery. To insert the newly created gallery in your post, click on Add FooGallery button > choose a gallery > Insert Gallery in your post. Now a gallery of your chosen style and appearance details would appear in your post. You can also modify the galleries you’ve created in future. Feel free to tinker when using plugins. Next Gen Gallery overcomes a lot of limitations of the ordinary gallery option, offers several transition and display options, and also supports e-commerce ability. It’s free, and also has some premium options for advanced customization. To use it, first install and activate the plugin. You can manage the plugin settings and galleries you create by clicking on the new Gallery option in your WordPress dashboard. Now there are two steps to add a gallery to your post. To add a new gallery, click on the Add Gallery button (green square) > go to Add Gallery/Images tab. To make a new gallery, insert a Gallery title. 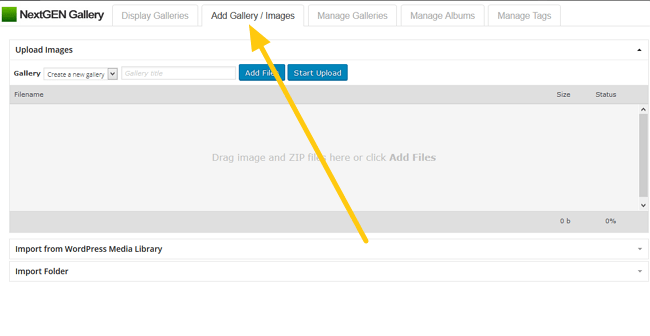 Select your preferred method for adding images to gallery (Upload Images, Import from WordPress Media Library, or Import Folder) > select the images you want to add (use ctrl/command+click to select multiple images) > and click on Import Images. You have successfully added a new gallery. Now your next step is to insert it into your post. 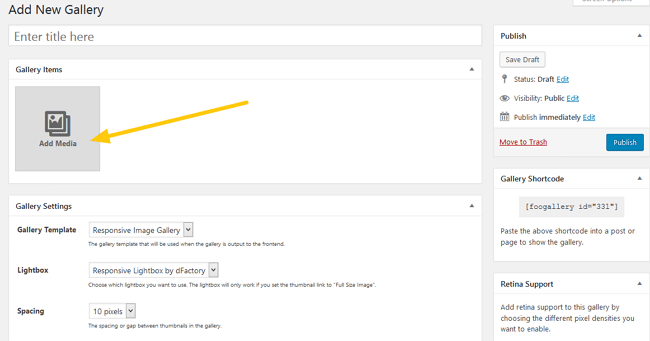 To do so, switch to Display Galleries tab and select your preferred display format. Now, type the name of your newly created gallery in the Galleries text box present inside What would you like to display? option > finally, click on Insert Displayed Gallery. This would insert the gallery you created in your post. A huge advantage of this plugin is that it presents all the images in gallery in an organized manner. You can individually change the details such as alt tags and description for each of them. Also, keep in mind that this plugin is slightly advanced, so might want to get a bit used to it. You can refer its documentation for any doubts you have, or to learn more. There are also demos for all gallery types which you can check.